Mackt tags was along with Spy tags the most frequent graffiti in Linkoping in the late 70’s and early 80’s. At least in my neighbourhood. Mackt was better live then captured here. But I still love this lo fi recording alot. Axelsson the guitarist later went on to Njurmannen who where one of the most influential industry bands here. Auwa the bass player played bass for The Flakes between 2001-2003. ON-Birds is a mystery band that I’ve later got to know included Jan Gradvall who now is a quiet famous rock journalist here in Sweden and where responsible for Linkopings first(?) punk fanzine Jorvars Gosskor who released this 7inch and a compilation tape called Arnes korvbar. Stand out tracks: Mat av plast, En kristen larare, Hasse Mattson and Pompeji. Very good, not totally incinerating-everything-else, but still good stuff. And of course I’ve never heard of this split before. Great cover! 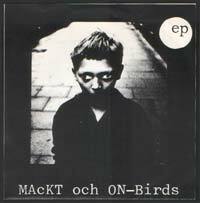 The Mackt side still rules and “Mat av Plast” is a fantastic song. Didn’t see them live, though, but I guess these Linköping-wankers never dared to come down to Gothenburg to play? Or did they? As far as I know Mackt never played outside Linkoping. I think IQ 55 was the only band from here that played outside Linkoping? I can be wrong. Yes, IQ 55 were down here and played on the second of the famous Slottskog-festivals. I remember having a chat with singer Leif (R.i.p)and Erik from Blitzen (can’t remember if he played but Blitzen had split up at that time), but anyway, IQ 55 were a good live band, even if this was at the end of their “career”. ON – Birds = unique.